Loving myself the way I am and being aware of things that can change and accepting it. Being conscious of the advice given to me from all directions about all things. Taking it all in with an open mind. Advice from others does not mean I lose pride, it does not mean I do not have confidence, but instead means that I am seeing from the eyes of another. To view things in perspective. Embracing change will allow me the ability to be able to adapt faster, understand easier. Change does not mean I am no longer myself, change makes rocks into gems. Every grain of sand, every heated day, all the time in the world will shape me into the perfect version of myself. But it's myself who I will always want to be. Hello friends! If you have not noticed already, I am not keeping up with my journal as much as I'd like. I think I say that every time I write one of these too, just because they are always MONTHS apart! Anyways, I digress. Some new and exciting things have happened since my last post and I am overwhelmed all the feels in my body right now! Since October I've... started a new relationship, become healthier with routinely going to the gym and eating better foods, and I've started a 6 month experience with work! With my relationship life (I know, you don't want to hear it. But I'm going to tell you anyways!) I made an online dating profile for fun to just meet some new people. Most were just random guys (and sometimes girls) around town looking for love. Me, on the other hand, I was perfectly content being single and not having to deal with the drama of a significant other. Out of the slew of messages I received from randoms, filtering them was easy when you have friends who wanted to mess with peoples love lives (it was hard to watch,) such heart breakers they were. But then I got a message from Dan. He was mysterious in a way where I just wanted to know more, even though our compatibility was pretty low on the percentile. The first message mentioned how his Pokemon squad was formidable, which meant I HAD to talk to this guy for real. And here we are, a couple months later and we're still a thing, it's great. As far as me being healthier goes...I have been making a constant effort to go to the gym and not eat my weight in french fries. This past week I went to the gym a total of 4 times, I'm quite proud of myself. Dan is a twice-a-day, gotta-get-a-workout kinda guy, which is helpful since I'm not always self motivating. He's good at explaining the benefits. I see slim results with the minimal things that I've been doing, so I think this has become a good routine so far. I'm also on a 3 day cleanse as of today. Day one started off great and full of energy, but the energy started to slow down around 4/5 PM. I wasn't hungry, just tired and bored. I'm drinking the 5th drink of the day now, but I don't think I'll be drinking the 6th. Maybe tomorrow, I'm just not feeling it. With work I've just started a new experience where I get to help my store train for new things, or train to improve old things. It's been so much fun so far, I've been able to do some research and really get a feel for what everyone's learning style is and what THEY see could be improved. I'm working on bringing everyone together and consistent so we can work towards the best customer experience everrrr! Hello friends! So during the beginning of the month I was super excited to be preparing for NYCC! With all the excitement and last minute prepping (you know me and my procrastination) I completely forgot that my job had asked me to help with a new store opening which took up majority of my prep time for the con... However, I had managed to juggle both my job and my cosplay. It was definitely not easy but I powered through....LIKE A CHAMP! In reference to my last post, I totally DID go to that Chive meetup... even though I should've stayed home and sewn my cosplay. No regrets though, it was loads of fun and I made new friends. It's always nice to go to things like this because you know that everyone is there for the same reason and to break the ice I just turned to them and said "hey, why are we not friends yet?" and that was that! It was super! The Chive has been really great lately, a great mix of people and personalities, I can't wait to go to the next! Since my Harley Quinn by Williann cosplay was far from finished, I had to get a move on, with not a minute to spare. All my time was devoted to finishing my cosplay with all the little details made to perfection. I stayed up until 5am on Friday trying to get everything together and missed my train in the morning but was able to catch the next one and off to NYCC I was! It as glorious! So many things to see, my favorite thing to do at cons is people watch and let me tell you, I was not disappointed! The main thing I wanted to do that whole weekend was see all my cosplay friends that I feel I've grown so close to over social media that if I didn't see them here I was afraid I wouldn't be able to catch them at another con. Monika Lee, LeeAnna Vamp, Lindsay Elyse, Riddle, and of course you all know my BFF (atleast in my mind) Jessica Nigri! They were all so sweet and kind! I cannot believe how comfortable they made me feel even though to them I'm a complete stranger that is only one like or one comment on Twitter, Instagram or Facebook. But the great thing is that some of them even recognized me from Twitter! When I asked for a poster from Lindsay Elyse signed to Tina she said "Tina from Twitter?" I FREAKED OUT! Completely blown away at how they remember something so small out of their thousands and even millions of followers. They are so inspiring and are all around my age, I hope within the next couple of years I'm able to accomplish as much as they have. To be able to be friends with all the rad people who go to cons, roam online, and play games with me even though I'm not that good. And to inspire others and be a role model of positive nature and following dreams. That would be amazing. So...Hi...Are we still friends? I know, I haven't been keeping up with this whole blog thing as much as I wanted. I'm sorry ;____; FORGIVE MEEEE. Anyways, I'm back and there has been an OBSURD amount of things that I've been up to and things I've gone to and will be going to in the near future and I figured why not tell people about what I've been doing. So since last time (a.k.a. last year) I have gone to Baltimore for Otakon 2014, had a birthday, painted my room, helped open a new store for my job, got promoted, went to see Wicked, physically visited Spandexworld, drove to Boston at 4 AM, met Johnny Cupcakes, saw a midnight showing of Mean Girls, was featured on The Chive, designed some stuff and tested out some new cosplay techniques. I'll put a gallery of all the things bunched up together on the bottom of this entry so you can all see. I pretty much just did what I could with the summer that I had. Rather than blabbing on the old, I figured I would just tell you about the new. New York Comic Con is quickly approaching and as always, I am rushing to do the finishing details on my cosplay. I will be recreating Williann's artist rendition of Harley Quinn!! It's a bit of a dousey since I have NO IDEA how to sew and/or start making a skin tight outfit like that, but I'm trying to make it work. After all is over I'll have some more time to upload some progress pics I've been taking just incase anyone wants to take a peek at those. I only have one day off before then so all my work will have to be done on nights once I get home and the one day I DO HAVE is to go to a Chive meet up in New York. I was thinking of bailing since my cosplay is a tad more important to me, but after being featured 3 times in one week I wanted to make it a point that I appreciated the attention...I'm also not one to bail on anything. Maybe if the meet up ends early I can continue my work on my Harley Quinn outfit. GUYZZZFLJNALKNVDLAKJHF! I. Went. To PAX East!!!! Saturday my cosplay was Nurse Akali from League of Legends and I was able to go through the LoL cosplay show and got some sweet swag, which I felt really cool carrying. I also was messaging Kristen Hughey since she was Miss Fortune to try and find her, she is so helpful and nice and doesn't think I'm weird which is always a plus :D I was also able to get in line to take pics with Jessica and Monika! They are such great people to take pics with and they remember me! THEY REMEMBER ME! AHHHHHH I pretty much had an out-of-body-died-and-came-back-to-life experience X_X it was FANTASTIC! Sunday was my cosplay day off so I was able to spend more time roaming the con. Hung out at the Twitch booth for a while to find that there were no bags for me (the free swag, I'll wait for it....BUT NO STUFF FOR YOU TINA!) lol jk I still thought it was cool, also tried to win some limited edition white hoodies but also failed at that :'( it's okay though because while in line I watched the gameplay of Evolve which looked pretty effin' sweet! Might get into that, no, definitely getting into that. I also was able to catch Lindsay Elyse, Destiny Nickelsen, and Meg Turney who were all amazing/fantastic/beautiful/rad ladies! Enjoy the photos I took below! A bit of a belated post but that's ok, I just wanted to tell you all about my baking adventures yesterday. The goal was to bake some homemade french macarons since it's the craze nowadays and when you put my mind with others (like Annie Grills) together to bake we can create amazing stuff. Our adventure starts off with me finding where Sandy Hook/Newtown is because I totally know it's 30 minutes from my house....but never actually had a reason to go in that direction. Thanks you handy-dandy GPS on my phone I found Annie's house, which was an accomplishment on its own since my track record with directions is....well, lets put it this way. If I don't go their 4 days a week then I probably don't know where it is. After our little roam around the store, we drove to the lot right next-door to get some lunch a.k.a. the best smelling foodie place to go to when you're craving awesome clam strip baskets that look like this! Our first batch was going to be raspberry cookies with homemade strawberry jam or whatever you call strawberries and sugar in a pot melted down for a CRAZY LONG TIME, either way it was like heaven or as Annie would say "it's made of strawberry, sugar and dreams." The cookies themselves were not bad at all, just a bit lumpy. But we re-watched all the videos and tried again but instead of doing one flavor we just did the other 4. It saved us a lot of time since we didn't finish until 9pm anyways and I got their at Noon. So our next 4 flavors we just sifted more, food processed more and lightly folded a bit more for our rosewater vanilla bean, orange creamcicle, green tea with orange blossom honey, and peanut butter with chocolate ganache. One of the key tips to making these cute cookies is that they do need to sit out for a while so they have a matte look to the top of them and while they were on the dining room table, Annie's mom came home and was admiring our work, but saw birds outside the window and while showing me the different kinds at the feeder, she didn't notice the cookies laying out on the table and put all her things down! Haha we weren't mad it was just hysterical that she didn't see them. 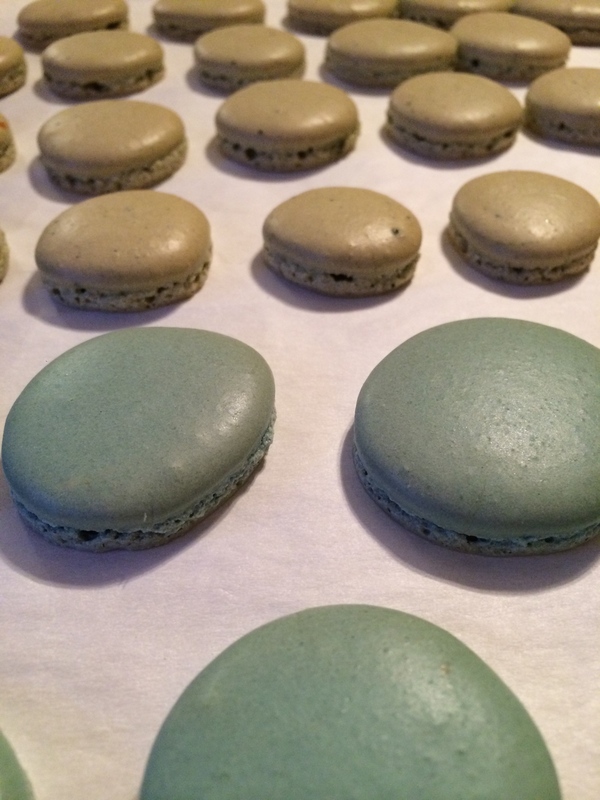 So there went the green tea ones, but still salvageable and we definitely still ate them. Our second batch of everything was more runny than the first because we added liquid to 2 (rosewater, orange) and powder to 2 (matcha green tea, peanut butter) we used an interesting peanut butter powder that we found at the grocery store. But these cookies came out the best looking and we were making the filling as we went so 3 of the 5 used a swiss meringue buttercream flavored all differently. 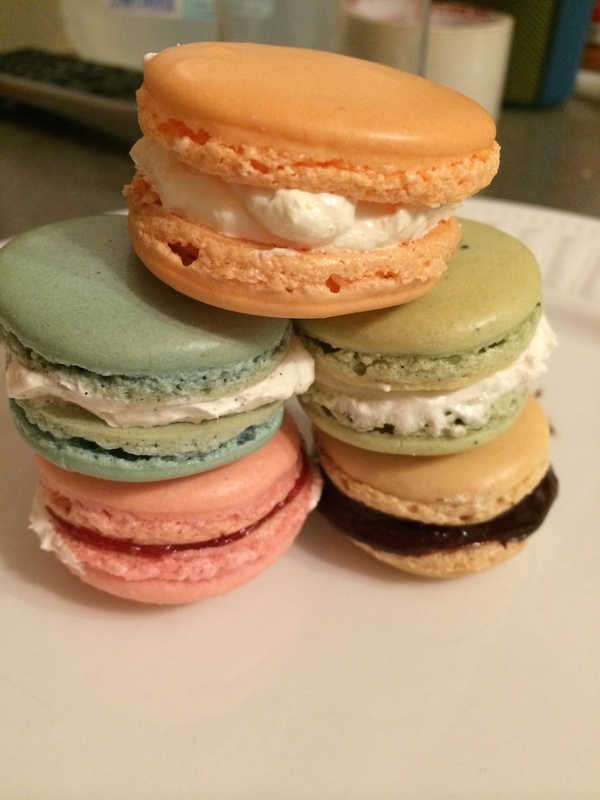 By the time we finished sandwiching them all together, licked all our fingers and packed 50/50 for me to bring home we had accomplished our first beautiful creation of french macarons. That wasn't so hard, was it? My SDCC Fail and Byebye Blonde! Yesterday was registration for SDCC and I had everything ready. Registration code, member ID, password etc. and all I had to do was put the code in between 10am-12pm... But I completely forgot -_- ....10 minutes late, I had no chance, fail. But it was a blessing in disguise because if I did get passes I would be spending SOOOOO MUCH RIDICULOUS MONEYYYY $$!&!$$$! So since I'm not going I hope everyone that is has loads of fun!